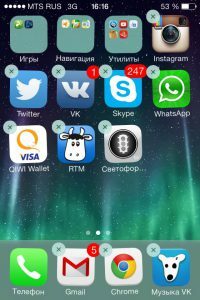 How to remove the application from iphone? 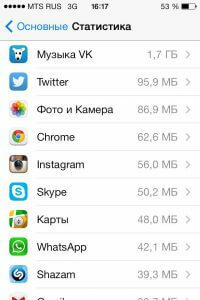 How to remove the application from the iPhone? This material will show you how to remove applications from your iPhone with specific examples. It will be incidentally to say that this instruction is also useful to the owners of other Apple products - the iPad tablet and the iPod Touch player. The fact is that the procedure for erasing applications from these devices is similar to operations with the phone. All shortcuts to programs on the iPhone are located on the so-called desktop system. 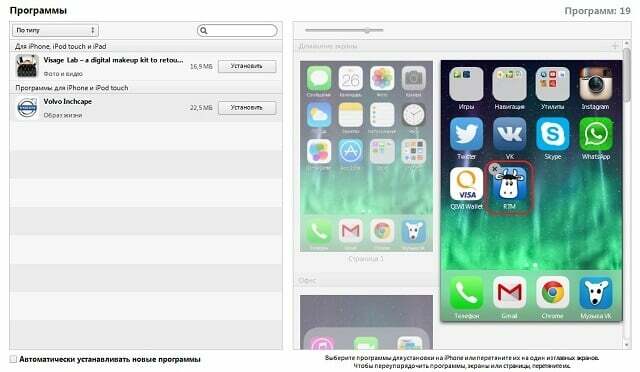 Among them there are applications installed by the user, and there are those that were already in iOS at the time of the phone purchase. These standard applications are part of the operating system and cannot be removed. By nm can be attributed Safari, Mail, Notes and other programs. All other software can be erased. There are several effective ways to do this. The simplest option to erase an application or game from an iPhone is to delete it by directly calling the necessary functionality from the desktop on the screen. To do this, you need to touch the application shortcut with your finger and hold it for a while. Do not release the icon until the shortcuts on the desktop start to move or shake. After that, you can proceed to the next step. Now you need to select the application you want to remove, and click the cross that appears in the upper left corner. You should be asked to erase the software of this type: "Removing the program (the name of the software) will also delete all its data." This means that together with the program all the information stored in it will be erased. Now you need to confirm the deletion by clicking the appropriate button. It will be useful to emphasize that this method is equally effective for the software located on the desktop of the screen, and for those programs and games that are located in the folders of the iPhone. 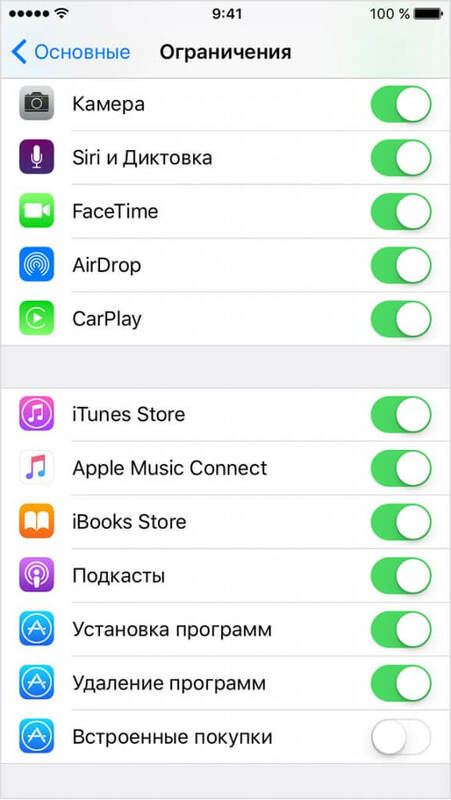 Another effective method of removing software and games from the iPhone is to use the capabilities of the standard “Settings” section. The manufacturer added this method of erasure to iOS operating systems of the fifth version and higher. That is, to implement this removal mechanism, you must first find out what firmware is used on the telephone. The first thing to do is run “Settings”. Then go to the section "Basic". Here you will need to select the “Statistics” item, after which a list of installed software and games will appear on the screen. The user can see the amount of space used by each utility. This method of deletion is very convenient in those cases when the memory of the device is full and you need to make a choice in favor of deleting one or another application. If there is no necessary software in the program list, you can click on the “Show all programs” icon. After that, you need to select the software to be deleted and click on the “Uninstall a program” icon. The last action is required two times. 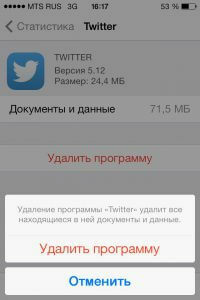 After that, the program will be erased from the iPhone. In addition to the above two ways to remove unnecessary or cumbersome utilities, there is another way to erase the program from your iPhone. To do this, you can use Apple’s proprietary software called iTunes. This option is perfect for those users who often connect their phone to a PC or laptop. So, you need to connect your iPhone to your computer using the USB cable that comes with the device. In this case, the latest version of iTunes should be installed on the PC or laptop. After starting the program, you must select your iPhone in the sidebar of the utility. If there is no such panel, press the key combination on the keyboard Ctrl + S. This operation is suitable for users who have a Windows operating system installed on their computer. After that, a window for managing your phone will appear on the right side of iTunes. Then you need to select the "Programs" section at the top of the screen. When viewing utility screens, select the program or game to be deleted and click the cross over the mouse by analogy with the first erasure method. If the user accidentally clicked on the removal of the application, then you can undo this action by selecting the option “Return”. For the final erasing of the program, you must click "Apply". After that, the stage of device synchronization will occur and the program or game will be permanently deleted from the iPhone. There may be a situation where none of the three ways to remove software and games do not work. In this program behave differently. For example, in the first case, application shortcuts twitch, but crosses do not appear for deletion. 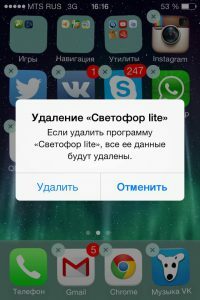 In the second method, there is no “Uninstall a program” icon, in the third version, iTunes cannot delete the program from the iPhone. Such a situation is possible provided that the restriction on the removal of software from the phone is enabled. Disable such a ban on erasing programs can be in the settings of the iPhone. Run the native iOS utility of the same name. Then go to the section "Basic", and select "Restrictions". Now you need to enter the password restrictions for iPhone and enable "Uninstall software". After that, you can return to any of the three ways to erase programs and games. Appsgames⟾IOS tutorials⟾How to remove the application from the iPhone?